Originally, I was going to publish One Starry Knight: Special Illustrated Edition on December 30, same as the original; I’d chosen that date because it’s the birthday of my friend who inspired Kaos. But instead, I ended up publishing the book far before that, on April 20, my birthday, instead. It all came together so flawlessly, which is saying a lot, considering I included artwork from thirteen brilliant and diverse artists. They were all perfectly on time, and I was able to publish the book without a hitch. God definitely had His hand in guiding that one. So why the switch to publish so much sooner? Well, something inside me had told me to finish the book before December. It was like God whispered to me, “That will be far too late; you’ll need it before then.” And as usual, God’s leading, combined with the uncanny intuition He’s blessed me, with proved correct. I decided to publish the book on my birthday, instead of the birthday of the man and dear friend who is my real-life Kaos. Only a couple weeks after I showed the book off at a book-signing for the first time, my heart was torn by some news that is still too deep and private for me to talk about. Long story short, we won’t be pursuing any kind of relationship beyond friendship, though I still consider him a dear friend and a good-hearted man; the man who tries to next win my heart will have huge shoes to fill, which isn’t really such a bad thing. Kaos helped raise the bar and helped me define exactly what I want in a life partner. Am I upset that I finished the book and poured so much money, heart, and soul into hiring artists to complete it by my early publication date? No, not at all. As with the real Kaos, I have no regrets. I knew that however things turned out, the book would at least be necessary for my healing. Its completion would allow me to move forward. The story behind the park: One night after we both got off work at midnight, real-life Kaos took me to that park for the first time. Hundreds and hundreds of fireflies sparkled in the trees like diamonds. Then, just like when Evren lays down in the boat in the book, Kaos had me lay back on the merri-go-round. He spun it round and round, and as the stars swirled above me, they felt almost close enough to touch. Twas the most magical night. I’ve returned to that park many a time to watch the stars, but it’s never felt as magical as on that first night when he was with me. As you can see here, Sarah was quite inspired and took some amazing shots of me as Evren, capturing Evren’s—and my—whimsy, longing, love for simplicity and nature, hopefulness, prayerfulness, and love. I will always love my Kaos. I have the fondest memories of him, and I learned and grew so much because of him. I continue to write about him, such as this, only because I cannot be with him. Expressing myself is necessary to continue my healing process, be that through writing, music, painting, whatever inspiration comes to me. My love for him is immortalized in One Starry Knight, but like Evren, it is time to lay that mission aside and ascend to the stars to complete my own healing. From there, I must wait to see what new adventure God has for me next. Meanwhile, dear readers, please enjoy reading our story! It’s a young adult fantasy romance novella, but I personally like to call it “an interracial fairy tale.” I believe that suits our story, both the real one and that portrayed in the book, quite perfectly indeed. My book can be found in paperback on Amazon.com and Barnesandnoble.com. Ebook version coming soon! 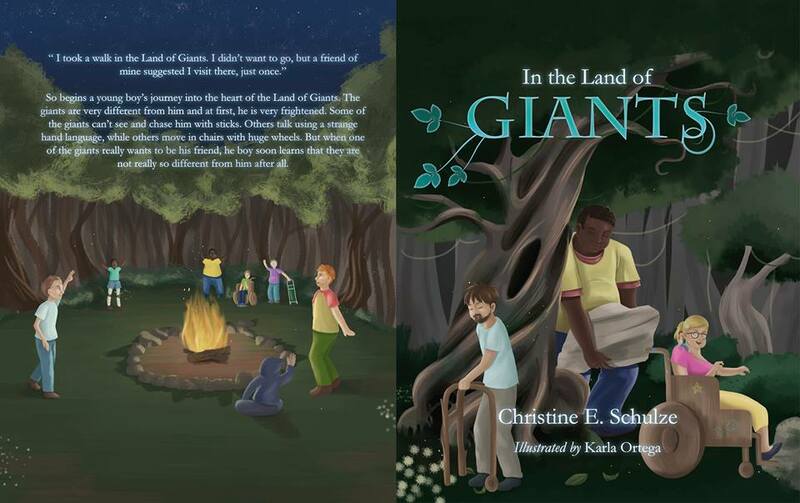 So, as stated in the previous post, today’s book signing was a major success–especially in regards to “In the Land of Giants” and “The Amazing K,” my two children’s books to feature characters with disabilities. I am not quite ready to release these books to the masses. But I have set the official publication date!! July 11, 2015. Just a couple short months away!! Less than that, really. Thanks so much, and stay tuned for more updates!! I featured a lot of other new and updated books at the signing and will be readying those for official online release as well. 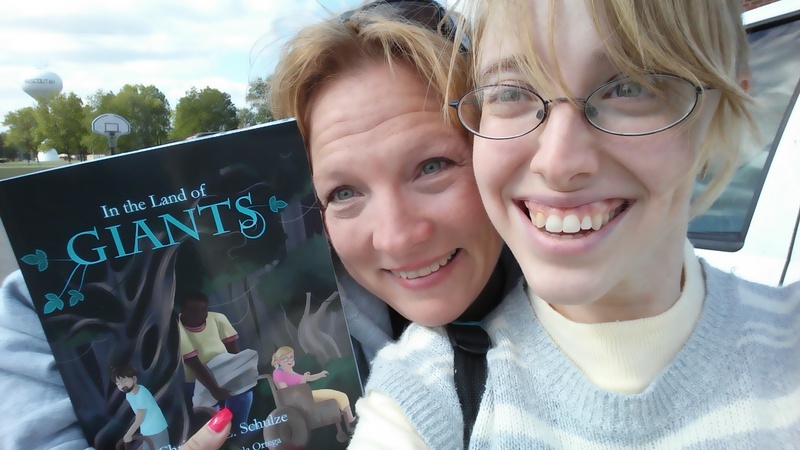 Here I am with Holly Midget, proud owner of the first copy of In the Land of Giants. I chose to give her the first copy because she has been such a huge supporter of the project and also is such a wonderful person to work with!! I once worked alongside her as an independent living counselor at Trinity Services; she now works as a job coach to help find jobs for our folks with disabilities. Holly says this is my greatest work to date as an author, I think it just might be. I have also decided to donate twenty-five percent of all my royalties to ALFA, an charity that helps create programs for folks with disabilities while also providing supplies and volunteers to work with them. I have worked alongside ALFA for some time now; they are a wonderful team with a true passion for helping folks with disabilities live full and abundant lives. I feel strongly in giving to ALFA through my books. I believe fervently in them, their purpose, and the wonderful people they serve. Thanks so much again for your support and encouragement, Holly!! I promise more great things to come, especially with the book-signing fast approaching! !